The Year That Was: Politics | From the Seasonally Occupied Territories . . .
As 2012 coasted to a close, I had the feeling that for me it had been a marking-time year, a pretty good year, but one in which I was pretty much standing still. Reviewing a year’s worth of blog posts and the stuff I posted to my Facebook timeline (sheesh, doesn’t the girl ever shut up? ), I see that I wasn’t standing still at all. I opened a few doors, wandered down a few paths, checked some things out. Not bad. Wow. Didn’t realize till I reviewed my 2012 just how much time and energy I’d put into politics, variously defined. The roundabout was the big story. It and I even made the Boston Globe in February. The story didn’t do what I most wanted it to do — explore and expose the State House machinations that are stuffing this thing down our craw — but I did get this cool photo of me and my hat. In a non-binding referendum, five of the six island towns voted overwhelmingly against the roundabout. The sixth town, Oak Bluffs, didn’t get to vote because its board of selectmen didn’t want to hear what the townspeople thought. As a direct result of my involvement in the anti-roundabout fight, I took out papers and ran for the Martha’s Vineyard Commission. I didn’t get elected, but I made a very respectable showing and learned a lot. No regrets. Will I try again? That depends on where the MVC, the island, and I are a year and a half from now. 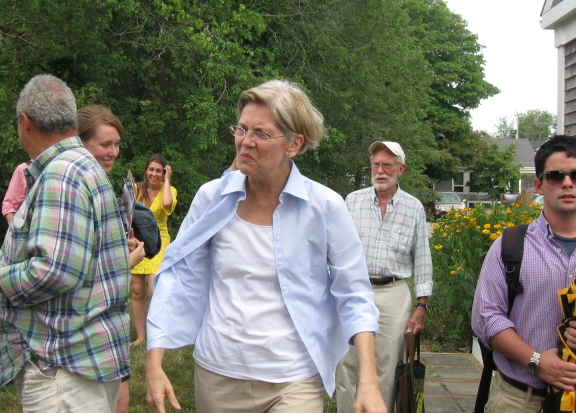 Candidate Warren at the West Tisbury library in July. In 2012 I paid more attention to electoral politics than I had in many, many years. Can’t remember ever being more enthusiastically for a candidate than I was for Elizabeth Warren. In the fall of 2011, I started making a small monthly contribution to her campaign, and kept it up through the general election. My personal high: At a rally behind the West Tisbury library in mid-July, I wished Elizabeth luck and told her I was running for local office. She hugged me. The candidate is now Senator Elizabeth Warren (D-Mass.). I’m thrilled. I also did a little work for and made a contribution to Sam Sutter’s bid for the Democratic nomination for U.S. Congress from the new 9th Congressional District. Sam lost in the primary, but I’m glad to know that he and others of comparable ability and integrity are out there. He raised my expectations enough that I couldn’t bring myself to vote for the Democratic nominee in the general election. I got sucked into a couple of West Tisbury issues, both of which involved dogs. Two Akitas were threatened with euthanasia after their owners repeatedly proved unable to keep them from getting loose and killing a neighbor’s chickens and geese. I took an interest because there but for fortune could go Travvy: Alaskan malamutes, like Akitas and like the Siberian huskies who’ve got into similar trouble in recent years, are northern breed dogs, who generally have a high prey drive. The dogs were rescued from death row with the understanding that they’d be rehomed with more responsible owners and never come back to the island. Thanks to deceit on the part of the owners, their lawyer, and a New York animal welfare group, and to carelessness on the part of the town, the dogs wound up in the hands of the original owners. Travvy isn’t a beach dog and I wouldn’t be caught dead on Lambert’s Cove Beach in the summer, but the matter of dogs on Lambert’s Cove Beach came up at three successive town meetings and so was pretty hard to avoid. It didn’t take long to figure out that the town’s Parks and Recreation committee, which oversees the town beach, didn’t have its act together. It dreamed up rules without consulting the people who would be affected by them, and without putting much thought into how they would be enforced — then seemed surprised that the rules encountered spirited opposition. A Friends of Lambert’s Cove Beach group organized, came up with a compromise proposal, and pitched in over the summer to make it work — which, by all accounts, it did. Shortly after they lost at June’s special town meeting, Parks & Rec — which by this point I was calling Poop & Wreck — put up a NO DOGS sign on the public tennis court they administer near the West Tisbury School. That tennis court is rarely used in the off-season and is frequently vacant even in high summer. For almost three years, Travvy and I had been using the tennis court for training. It was a perfect place for working off-leash: close to where I live, well fenced, and hardly ever used for tennis. When anyone did show up to play tennis, we’d leave. Sometimes people would stop to watch us, and ask what we were doing. It was fun, and friendly. Poop & Wreck, however, had received complaints. Did they try to find out if the complaints were justified? They did not. Did they make any effort to find out if Travvy’s and my use of the court had caused any damage, or prevented any tennis players from playing tennis? They did not. I suspect that they noticed that I’d spoken and voted in favor of the Friends of Lambert’s Cove Beach group, and that’s all they needed to know. I went to a selectmen’s meeting to see if anything could be done. Here I was trying to be a responsible dog owner and work with my northern breed dog in a way that didn’t put local livestock in danger, and Poop & Wreck was saying NO DOGS? The selectmen seemed sympathetic, but said they had no jurisdiction over Poop & Wreck. It seemed my only recourse was to get my little request — please may my dog and I use the tennis court to train when no one’s playing tennis? — on the town meeting warrant. I’d seen how nasty P&W’s friends and relatives were to the Friends group. The Friends were many. I was one. I gave up. Elizabeth Warren, Sam Sutter, and Barack Obama, all of whom I enthusiastically supported, are Democrats. I usually vote Democratic. But I can’t help noting that it’s a Democratic State House that’s stuffing the roundabout down our throats, and Democratic state legislators who have proven too gutless to stand up for their Vineyard constituents. Our votes are too few to figure in their re-election calculus. The fellow who as MVC chair did as much as anyone to support the roundabout was also a co-host for an Elizabeth Warren fundraiser. I don’t know how the Poop & Wreckers are registered or how they usually vote, but I have this hunch that they usually vote the way I do. We are not, however, on the same side. This entry was posted in dogs, public life and tagged dogs, election 2012, Elizabeth Warren, MVC, politics, roundabout, Sam Sutter, town government, Travvy, West Tisbury. Bookmark the permalink. A fun read . . . I had never seen the photo of you with your hat — great shot! I cannot say the same of the photo of Elizabeth Warren — an unfortunate sour-puss capture. I’m sorry to read about Travvy’s banishment from the tennis court . . . I wish you had not given up so easily. Hopefully you have found someplace new to practice. Hmm, maybe I should use a different pic of Warren? I thought she looked intent and focused, but now that you mention it, it does look a little sour. We access to another place for a while, but that dried up. I really hate letting Parks & Rec get away with this. It’s one of the few times in my life I’ve ever thought “If I had enough money, I’d sue.” But I’m the only person affected, and there’s no appeals procedure short of town meeting. It’s a micro version of what’s going on with the roundabout: a stupid decision and no way to reverse it. Bringing the old saying that “the enemy of your enemy is your friend” into big question. Funny how that works, isn’t it? It takes me right back to People and Predicaments. When people are connected to each other in various and sometimes contradictory ways, it’s hard to tell who’s friend and who’s foe — and if you figure it out, it might change tomorrow.